In Windows 10, the Command Prompt has been improved tremendously. You can select text and press Enter to have that text copied. This means that if we install SSH Client for Windows on a Windows 10 box, we will be able to run it from the Command Prompt, select text and copy/paste it live, just like we could with Putty. 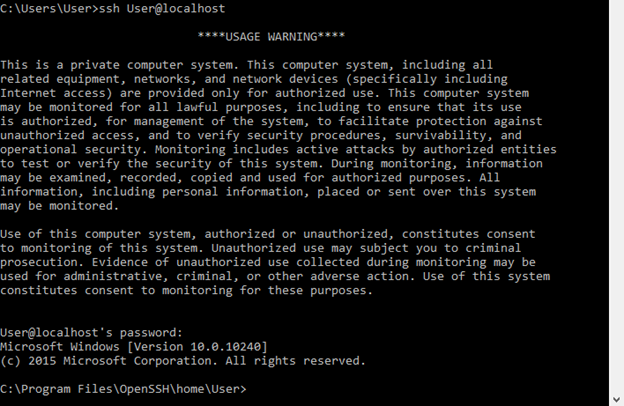 In this guide I will show you how to install SSH Client and SSH Server on the same Windows 10 Box. Or browse to the following site to download SSH for Windows. Currently it is at version 7.1. After installation, we can launch ssh client by typing the following command to connect to a remote server. To demonstrate text selection, I have selected three lines (white highlight) in the below screen.